Photo: David Ramos/Getty Images (File). Classics riders like 2017 Roubaix champion Greg Van Avermaet are keen to hone their form at Tour of Oman and other Middle Eastern races. The battles on Northern Europe’s cobblestone roads are still months away, however the built-up for the Tour of Flanders, Paris-Roubaix, and other one-day races begins in earnest this coming week at the Tour of Oman, February 16-21. The race represents a crucial block of racing across the windy, flat roads in the desert for the sport’s stars of the cobbled classics. The race’s lineup includes Greg van Avermaet (CCC), Nikki Terpstra (Direct Energie), Silvan Dillier and Olivier Naesen (both Ag2r La Mondiale), Alexey Lutsenko (Astana), and Andre Greipel (Arkéa Samsic), among others. Noticeably absent, however, is team Deceuninck-Quick Step. This year’s Tour of Oman is again comprised of a blend of flat and hilly stages, with the summit finish to Green Mountain providing a test for climbers on the penultimate stage. Last year, Miguel Angel Lopez took the stage win on the punchy slope after his Astana team shed the entire field at the base of the climb. His teammate Lutsenko went on to win the overall. Van Avermaet and the other classics contenders are unlikely to challenge for the victory on Green Mountain, with the 2019 lineup also including climbers like Darwin Atapuma (Cofidis) and Domenico Pozzovivo (Bahrain-Merida). The other stages, however, provide the flatlanders ample opportunity to test their legs on flat and punchy terrain. The race’s second stage, from Royal Cavalry Oman to Al Bustan, includes three climbs that average nearly nine percent. The third stage to Quarayyat finishes with a 3km climb. And the fourth stage from Yiti to the Oman Convention and Exhibition Center includes three ascents of the Al Jabal Street, a 3.2km climb that has ramps above eight percent. The 2019 edition marks the 10th running of the Tour of Oman. Norwegian Alexander Kristoff (UAE Team Emirates) has the most stage wins at the race, with eight. Kristoff, a former winner of Flanders and Milano-Sanremo, will attend the 2019 race. Van Avermaet took his first Oman stage victory last season. He said he hopes to add to his tally this year. 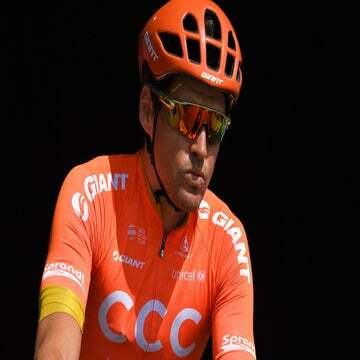 Just last week Van Avermaet took an important first victory wearing the orange colors of his CCC pro cycling team at the Volta a Comunitat Valenciana.